As a sports fisher I have been fortunate to have had a number of encounters with Killer Whales while on coastal waters. 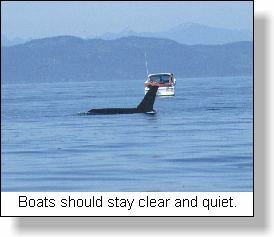 Many have occurredin the calm northern area of the Strait of Georgia, south and east of Hornby Island, and south of Quadra Island, while others have occurred in the mystical wild waters of Johnstone Strait. The most dramatic happened in Johnstone Strait one August when I was canoeing to the estuary of the Eve river to fly fish for pink salmon. My partner and I had launched my canoe at a logging company's dryland log sort, about two miles from the river estuary, during an extreme low tide. Our paddling route followed the edge of the deep drop-off ledge along the intertidal beach. As we neared the river mouth, a school of salmon showed on the surface in front of us. I suggested to my partner that he pick up his fly rod and cast to these fish. I was in the stern of the canoe and could better manoeuvre it for his presentation. On his third cast a powerful coho took the fly and began such an aerial display, that I told him I was going to beach the canoe to make it easier to fight this particular flashy salmon. The intertidal beach was only a few meters away even though we were over the drop-off, with the result that it only took me moments to beach the canoe bow on sand. But, as soon as I beached the canoe, our two Brittany spaniels, who had romped and followed us along the beach, leaped in the canoe with their spaniel greetings resulting in massive confusion for a few moments. It seemed that just as we calmed the dogs, a deep resonating 'whooooshing' sound bombarded us as two hunting Killer Whales, dorsal fins close enough to hook with a cast fly, assaulted the same school of salmon. They were that close and they were that massive! We simply stood in awe as a feeding carnage occurred immediately in front of us. Then, almost as quickly as it occurred, all was silent. Even the dogs had been so overwhelmed that they forgot to bark. Such being the will of the fisher, my able partner, and I still to this day do not know how, held onto the hooked but running coho. He told me later that he simply let the fish run. It appeared that there was sufficient backing on the reel to keep the coho further down the shore and away from the pink salmon school upon which the Killer Whales were feeding. Later that same day we again witnessed this hunting pair of orcas as they herded schools of pink salmon into the low summer waters of the river. Once, as the tide began to flood in earnest, one Killer whale actually swam up into the shallow channel after a panicking school of salmon, and then, turned just as it shallowed on a small sand bar. That raw experience remains as strong today as if it were just yesterday. Do Killer whales, often called 'Blackfish' by salmon sports fishers, scare away salmon? This is a common myth which likely has much truth particularly for deep swimming chinook, which are their most common summer food. However, it has been my experiences, and there have been a number, that salmon have not stopped striking when a pod of orca have cruised past. Granted, I am usually targeting coho in my salmon fishing but, I have had situations where chinook have remained on the bite even after the Blackfish have come and gone. According to the Parks Branch, Killer whales or orca inhabit all oceans. 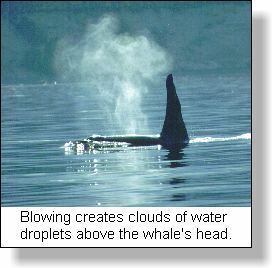 In British Columbia it is estimated that over 600 whales inhabit our coastal waters. These have been separated into two divisions, the northern residents who inhabit waters from Johnstone Strait north to the Alaska panhandle and, the southern residents who live in the Strait of Georgia, Puget Sound and Juan de Fuca waters. Killer whales are classified as either resident or transient. Resident killer whales appear to feed only on fish with the result that they are frequently observed during the summer and fall as they pursue migrating salmon. Transient Killer whales on the other hand are the "killer of whales' for which they have been named. Transients depend on warm-blooded prey including whales, seals, porpoises and sea-lions. Photo identification of Killer whales has resulted in a much greater understanding of the habits and social structures of these monarchs of the ocean predators. 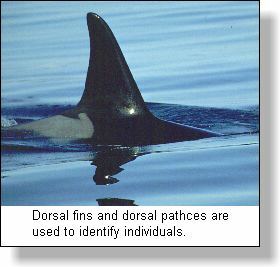 High quality black and white photos are used to identify each whale by the markings and nicks on their dorsal fin and, by the saddle patch behind the fin. Under the Fisheries Act, the Department of Fisheries & Oceans is responsible for the management and protection of Killer whales. Guidelines for watching Killer whales suggest that you, "approach no closer than 100 metres and shift your motor into neutral or idle. Keep noise levels down - no horns, whistles or racing motors. Leave the area slowly, gradually accelerating when more than 300 metres from the whales"
Those who are fortunate enough to see Killer whales are requested to report all sightings to Marine Mammal Research Group at 1-800-665-5939. 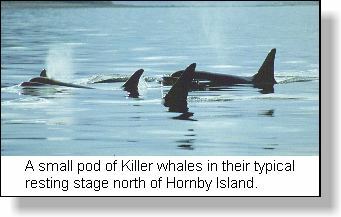 Killer whales were once thought to be vicious predators and were the victims of indiscriminate killing. In recent years however, as we have come to understand their importance in the complex west coast aquatic ecosystem, they are now viewed with near reverence. To see these gigantic creatures in our coastal wilderness fiords is an experience never forgotten.